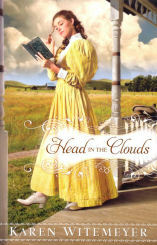 About the Book: Adelaide Proctor is a young woman with her head in the clouds, longing for a real-life storybook hero to claim as her own. But when a husband-hunting debacle leaves her humiliated, she interviews for a staid governess position on a central Texas sheep ranch and vows to leave her romantic yearnings behind. Please note this is not a review. I did receive a copy of this book from the publisher.